Migrating vultures have developed a habit of ripping off windshield wipers, sunroof seals, and other rubber and vinyl vehicle parts. 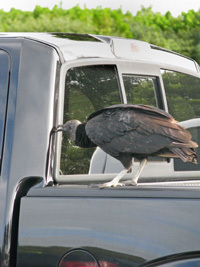 Visitors to the park’s Homestead and Flamingo entrances are loaned “anti-vulture kits” to protect their vehicles. Park wildlife biologist Skip Snow tells The Miami Herald that the vultures are migrating as normal. It’s just not clear why the birds are picking at parked cars and trucks. Park employees have tried to scare away the vultures, but nothing has worked. A man tried to break into more than 100 cars parked on the street in Idaho Falls on a snowy night. Most were locked, but he managed to get into several of the vehicles and steal cash and a GPS unit before walking to his nearby home. Police followed the footprints in the snow to his place and arrested him. And, anyway, what do you expect us to do about it? Canadians doing their holiday shopping on Boxing Day last month became frustrated at the huge traffic jams in Vancouver, British Columbia, and deluged law enforcement authorities with complaints on the 911 emergency line. Royal Canadian Mounted Police responded with a statement that you aren’t supposed to call 911 simply because you are stuck in traffic. Fifteen seconds before Randy Atkins’ daughter Nevaeh was born on October 9th, he snapped a picture of something that even the doctor who delivered her has never seen before. The photograph shows the baby’s hand reaching out while she is still in the womb and grabbing the doctor’s finger. Mr. Atkins and his wife Alicia posted the picture on Facebook just before Christmas and it has since gone viral. Mrs. Atkins, who is herself a professional photographer, had the picture printed on canvas and gave a copy to Dr. Allan Sawyer, who delivered her daughter. Dr. Sawyer said the photograph showed something “really rare.” He said he usually sees the baby’s head appear first.